When you hear the term “weight lifting,” you may think of body builders with bulging muscles. Only in the past few years has it become more widely known that weight lifting — often called strength training — also helps control body weight and increase bone mass. What most people still don’t know: Weight lifting can play a significant role in relieving muscle and joint pain. Even though doctors often overlook muscle weakness as a cause of pain, it is the culprit in an estimated 80% to 90% of my patients, many of whom are ages 60 to 90 and suffer from aching joints and muscles. Surprisingly, muscle weakness contributes to pain even in people who have been told by a physician that a structural problem, such as a torn ligament or arthritis, is responsible for their symptoms. WHY DO STRONG MUSCLES FIGHT PAIN? Exercises designed to strengthen muscles improve joint function and overall body mechanics in two important ways. When the muscles of a joint are weak, the bones can move out of position, causing bone surfaces to rub together and leading to irritation and pain at the joint. Also, because muscles work together to produce movement, if one is underdeveloped, other muscles can easily become strained. The following exercises target areas that are especially prone to pain-causing muscle weakness that often goes undetected. The exercises require hand weights or ankle weights. Both are available at sporting-goods stores. Typical cost: Hand weights — $10 a pair… ankle weights — $20 a pair. Helpful: When choosing weights, select ones that you can lift about 10 times without straining. If your muscles are not tired by the time of the last repetition, choose a heavier weight. 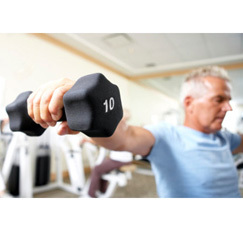 For each exercise, perform three sets of 10 repetitions two to three times a week. * As you lift the weight, breathe out and count to two… as you lower it, breathe in and count to three. Important: See a doctor if your pain was caused by a traumatic injury, such as a fall… if your discomfort is constant and/or severe… or if you have limited range of motion (less than 50% of your normal range). In these cases, the pain may be due to a problem that cannot be improved with exercise. What’s targeted: The rotator-cuff muscles, which hold the humerus (upper arm) bone in place when you lift your arm. Building the rotator-cuff muscles also alleviates the strain on forearm muscles that leads to elbow pain. Rotator-cuff muscles can be strained during such activities as driving or using a computer for long periods without supporting the arms. What to do: Sit in a chair placed at the front edge of a table with your left side a few inches from the corner of the table. Hold a weight in your left hand and rest your left elbow on the front edge of the table. Your hand should be about three inches below the table top with your palm facing down. Raise your forearm, keeping your wrist straight, until your hand is about three inches above the table. Lower the weight to the starting position. Reposition the chair so that your right side is next to the table, and repeat the exercise with the weight in your right hand. What’s targeted: The posterior-deltoid muscles located at the back of the shoulders. These muscles tend to be weaker than the front shoulder muscles due to our natural tendency to hold and carry objects in front of our bodies, which makes the chest, front shoulder and bicep muscles work harder. This imbalance can throw off bone alignment in the shoulder joints, causing pain. What to do: Stand with your feet a little more than shoulder-width apart. Position yourself so that your knees and elbows are slightly bent and your back slightly arched. Hold a weight in each hand in front of your thighs, palms facing each other. Using your shoulders, extend your arms out to the side until the weights are about six inches from your thighs, stopping the motion before your shoulder blades begin to come together. Return the weights to the starting position. What’s targeted: The wrist-extensor muscles, which run along the top of the forearm. Building these muscles relieves strains caused by gardening, playing tennis or other activities involving repetitive wrist movement, gripping or squeezing. What to do: Sit with your feet flat on the floor directly under your knees. While holding a weight in your right hand, rest your right forearm on the top of your right thigh with your wrist about three inches directly in front of your knee and your palm facing down. Place your left hand on your right forearm to keep it steady. Using your wrist muscles, lift the weight until your wrist is fully flexed. Return to the starting position. Repeat the exercise on your left thigh, using your left hand. What’s targeted: The hip-abductor muscles, which support your legs when you walk and climb stairs. Strengthening these muscles can relieve muscle strain at the hip joint and prevent the knee and foot from rotating toward the midline of your body when you walk (causing knee pain and heel pain) — instead of staying in line with your hip. What to do: Lie on your right side on a carpeted floor or a mat with an ankle weight strapped to your left leg. Fold your right arm under your head and bend your right leg. Place your left hand on the floor in front of you for support. Flex your left foot (as if standing on it) and raise your straightened left leg to hip height, keeping it in line with your torso. Lower your leg to the starting position. Lie on your left side and repeat the exercise raising your right leg. *Consult your doctor before starting any new exercise program.